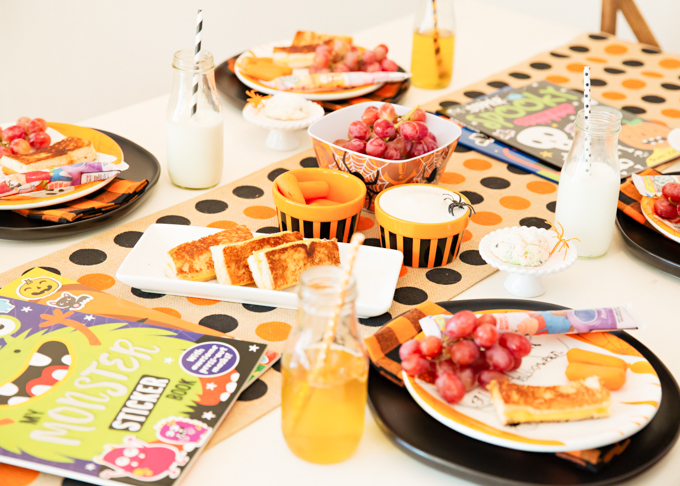 I’ve been doing a lot of Fall Tablescapes, but hadn’t done anything for the little ones yet, so………here you go……Halloween Lunch for Your Little Ones! 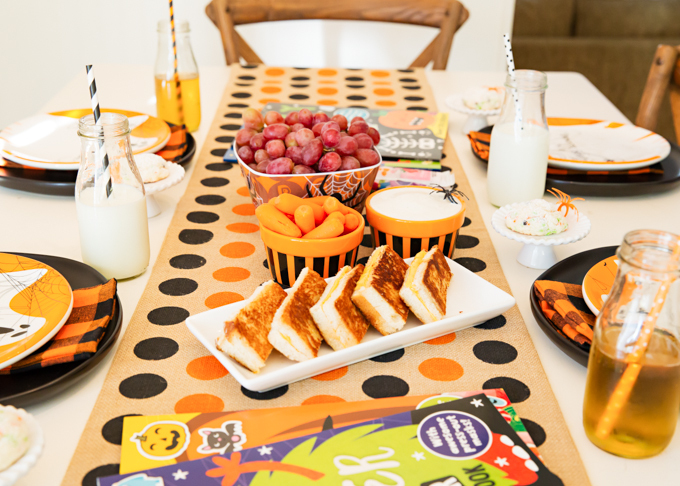 Do you have fun traditions that you do with your little ones on Halloween? The past few years we’ve been hosting Trick-or-Treat from our house. Chili is the typical meal for the grown ups and I always do something a little more fun for the little ones. 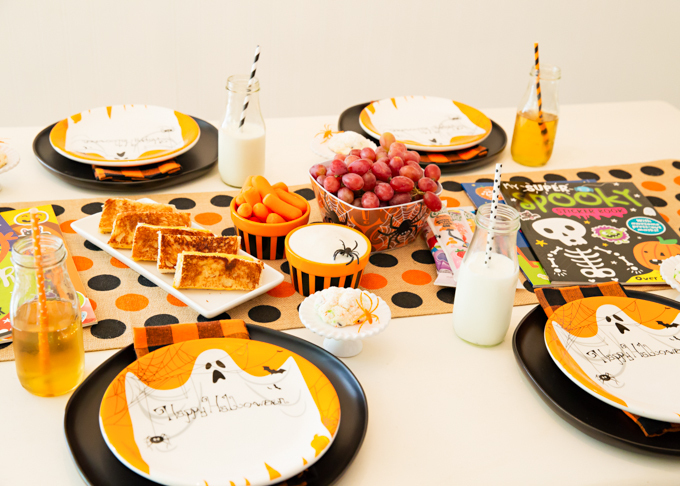 There’s a link at the bottom of this post where you might get a few ideas to feel your little ghosts and ghouls this Halloween. 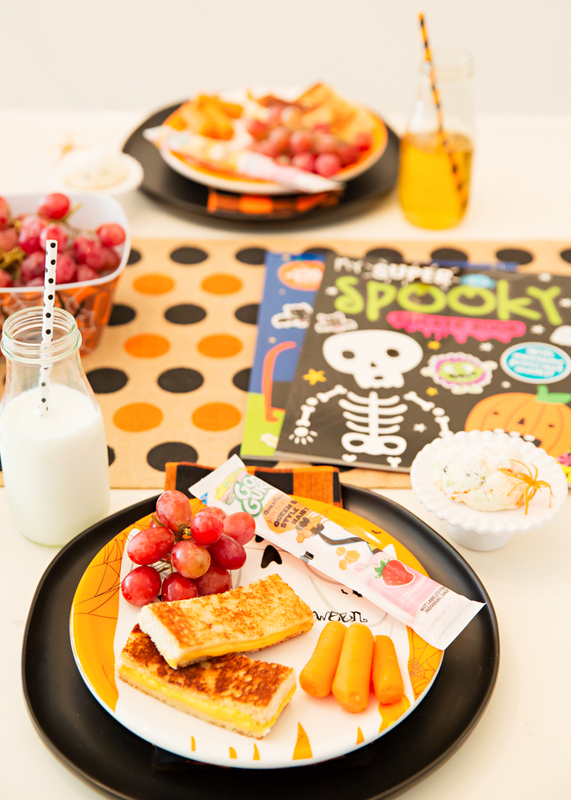 In the meantime, let’s talk about a little lunch for the kiddos. 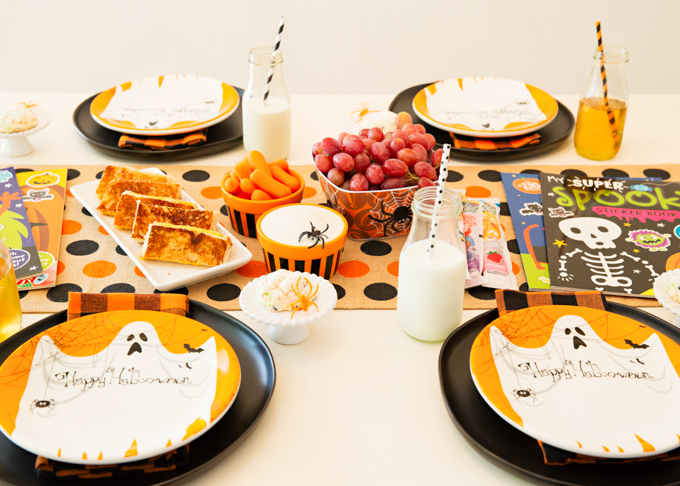 I mean, seriously what little one isn’t going to want to sit down and eat when their lunch is as Spook-tacular as this!! I picked up the ghost plates at Home Goods earlier in the season and used my Hearth & Hand black plates from Target as a charger. 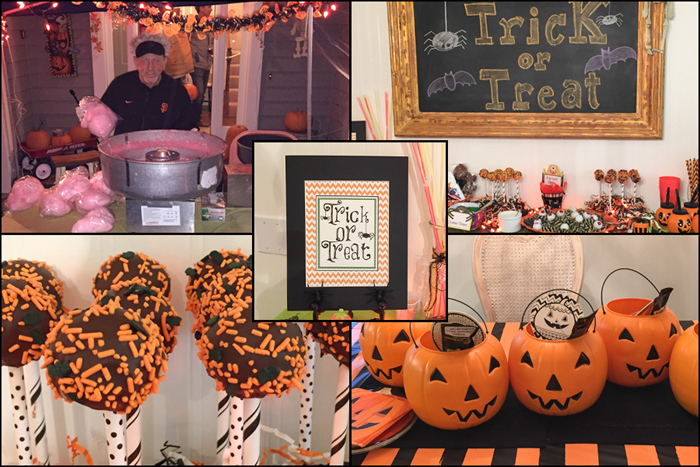 I’ve had the polka dot runner for a few years and love getting to pull it out and use it for Halloween. 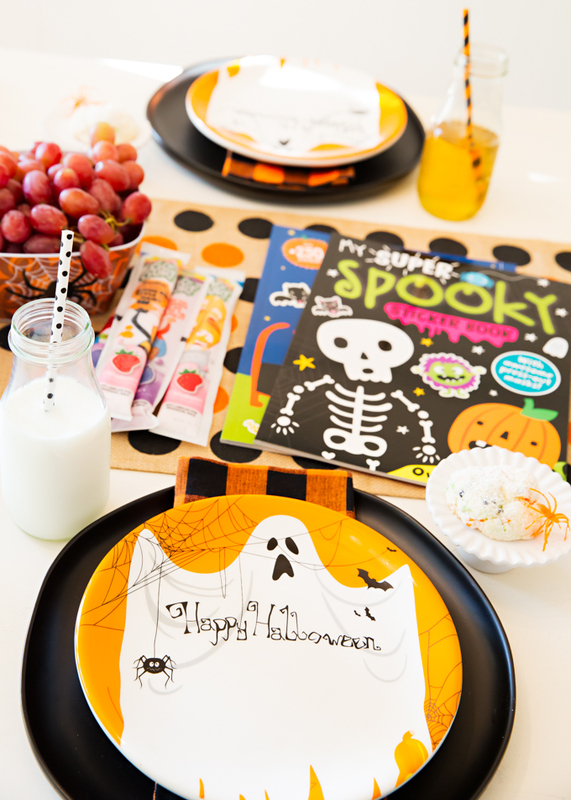 I knew it had to be on the table for the Halloween Lunch for Your Little Ones. Lunch was simple and somewhat healthy! 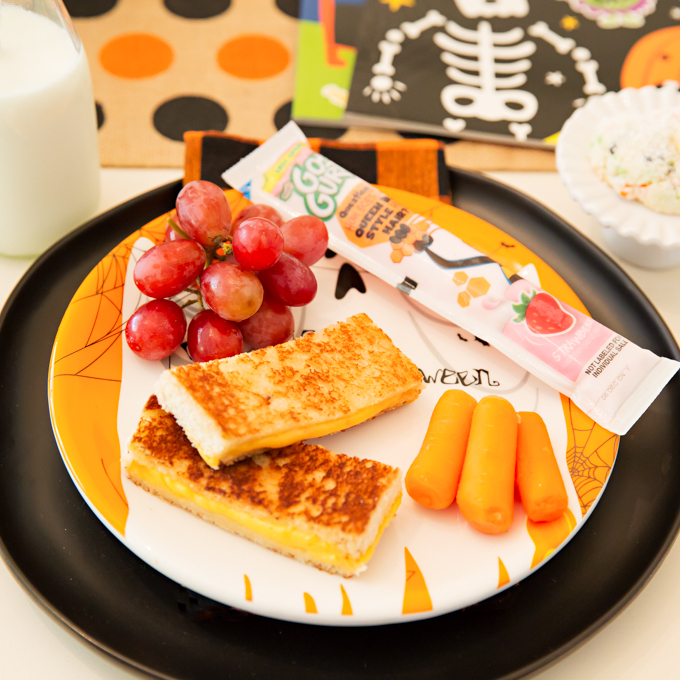 Grilled cheese sandwiches (cut into strips), fresh grapes, carrots w/ranch dip, and a Gogurt. Apple juice or milk were the beverage choices and of course, I used my milk bottles with a fun straw. One Gooey Sprinkle Cookie (with Halloween sprinkles) was plenty for dessert. 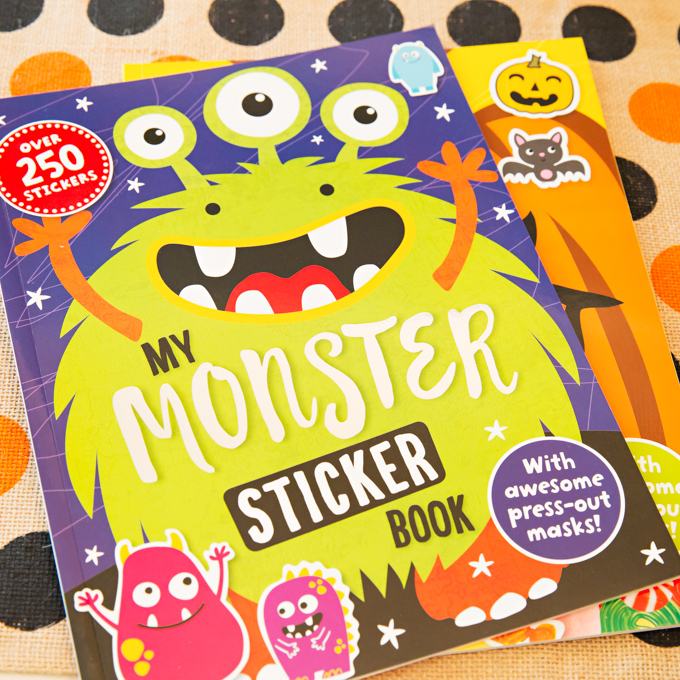 I picked up these Halloween Sticker Books from the dollar section at Target and they were the perfect party gift! I don’t think I’ve ever met a little one that doesn’t like stickers! 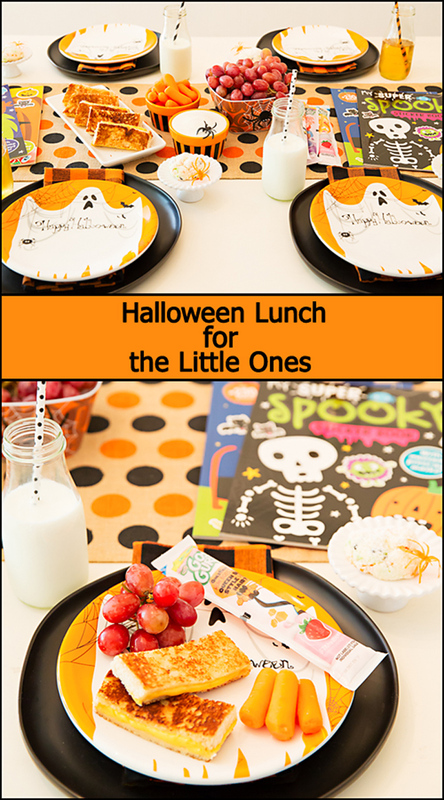 This Halloween Lunch for Your Little Ones was simple and fun to put together, and the best part is that the kids loved it!!!! I hope you love this idea as much as I do and will share by PINNING the image below to your favorite Pinterest board. Happy Halloween! Have fun and stay safe! Here’s how we host Trick-or-Treat at our house. 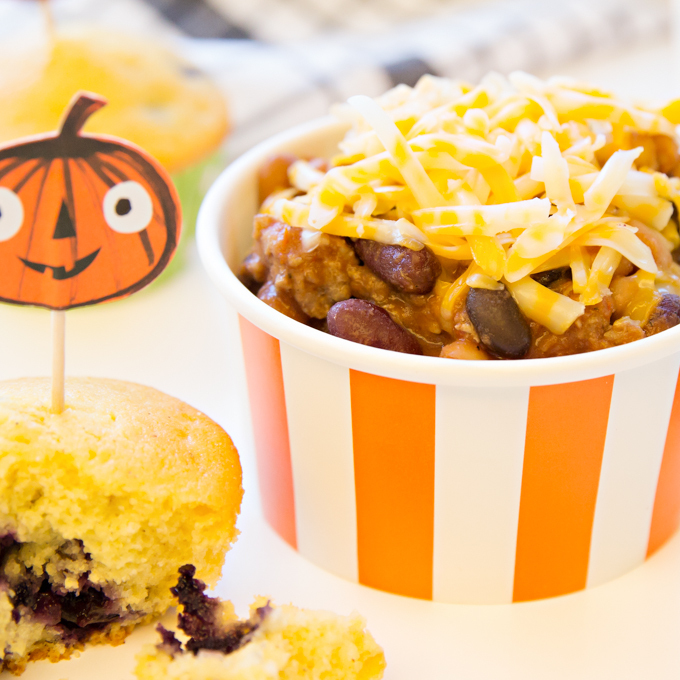 Here’s a Simple Chili recipe that the little ones love!